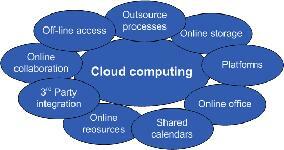 Cloud computing means using remote Internet-based servers for cloud-based applications and information exchange. This is emerging as the best way to service the new global infrastructure. The next five years will see the steady emergence of cloud computing in the automation world. Cloud computing means using large, remote Internet-based servers in the same way as if they belonged to your own company. Very large data pipes allow large groups of server farms to appear as if they are local to the plant. The result is huge economies of scale and focused communities of excellence. Companies can ramp up or down with required computing power, and peaks in demand can be handled easily and relatively inexpensively. Pay-for-use operating expenses are vastly better for balance sheets than large, recurring capital investments for new computer hardware and software, plus local support. In the automation world, the benefits of cloud computing are still being weighed up against the risks. Process managers and automation engineers are averse to putting their operating software and plant information on remote servers, primarily because of perceptions of reduced security, questionable availability and uncertain location, even though company-owned servers are already somewhat distant and inaccessible. The use of virtualized servers is becoming attractive for end users. Control rooms have limited space, particularly those located in older plants or at offshore facilities. Already, fewer, larger servers are being used to run multiple applications such as workstations, historians and human-machine interfaces (HMIs), and those are mostly remote in any case. Moving to cloud servers has many advantages beyond just space consolidation. In any event, moving an actual distributed control system (DCS) to the cloud is not likely to happen quickly. However, secondary processes and systems such as HMIs, historians, training systems and engineering workstations may well be moved, albeit tentatively, as plant managers become more comfortable with the concept. Particularly with multiple global locations, functions like historians are often combined in larger databases to allow operating and efficiency comparisons. Having these located in cloud infrastructure makes a lot of sense, reducing dependency on corporate networks, which are remote and cloud-like in any case. It should be noted that, beyond direct process control and related applications, other sections of manufacturing plants are already moving rapidly to the cloud because of overwhelming functional as well as cost advantages. Today, there can be no isolated information "silos." Value chains are much more complex and fragmented and must be made capable of responding quickly to the shorter product life cycles demanded by increased competition. Manufacturing intelligence must be distributed not just between production operations and corporate offices, but also other global locations, key suppliers and customer partners. This integration across core activities is simply a matter of supply-chain effectiveness, efficiency and global competitiveness. The integrated information model must span the entire enterprise regardless of size, geography or complexity, integrating multiple tiers of information - manufacturing execution systems, automation systems and enterprise applications - to drive planning and execution closer together. Cloud-based applications and information exchange is the best way to service this new global infrastructure. The key point that fuels doubts is: How secure (safe and spy-proof) is the remote data? As cloud computing's market potential grows, so too does its risk profile. Amazon, one of the largest suppliers, recently had a widespread outage that temporarily crippled some of the highly trafficked websites, computing resources and data centers it hosts. By comparison, had this computing infrastructure been at just one business, the problems would have been related only to that business; when Amazon's cloud failed, it affected many, vastly different businesses. Cloud computing will be used in more and more factories and process plants over the coming years. As the cost savings are demonstrated, the pressure to implement will increase steadily. The next five years will see the steady emergence of cloud computing in the automation world.